In marketing circles last week there was a lot of buzz about the layoffs P&G had just announced. You can see for yourself in this Business Insider article what the root cause of the 1,600 pink slips was. In a nutshell: Digital marketing. To be more specific: Social media. My heart goes out to those who are now having to figure things out in this still-difficult job market. I also feel badly for those marketers who will mistake P&G’s decision as the proof they need to [continue to] refer to digital marketing–particularly of the Facebook variety–as being free. More efficient? Yes. Free? Far from it. Marketing in a social environment like Facebook might not require all of the trappings that go along with owning a true piece of site real estate of your own–domain names, hosting, code, traditional search optimization, etc. Especially if you are trying to operate lean and mean–and if you don’t care about people finding you organically in the social network. But the effort it requires to keep a social stream in Facebook populated does not just come out of nowhere. It takes time, inspiration and people. And if you want to stand out from the standard network template–the way these five agency Facebook pages stood out for the team at DigiDay, for instance–rest assured you’re going to need to do some coding. Additional hidden cost with Facebook? They own you. Literally. With the price of free on Facebook comes the need to be flexible enough to react to format changes the Facebook team often pursues with little/no warning. The biggest price of all? The fact that you don’t own any of the data that comes along with your Facebook outpost. So again, my condolences to the 1,600 at P&G who are no longer at P&G. But my condolences as well to any one who misreads the tea leaves and mistakes digital as being a purely dollar-saving component within their marketing toolkit. A little over a month ago, Catherine and I went downtown for a date night at the theater. Following an awesome series of Spanish tapas at Solera we wound up in comfy seats watching a story unwind in France. I blogged about it in this post on Tumblr, but since my activities there are fleeting at best, thought I would link to it from here. Bottom line: Whenever you have an audience, the best way to ensure their attention from the outset is to help them forget about the places or situations from which they had just come. Bring the stage, podium, etc. to them to such an extent that it, literally, becomes part of their own experience and not something which they are watching or to which they are merely listening. 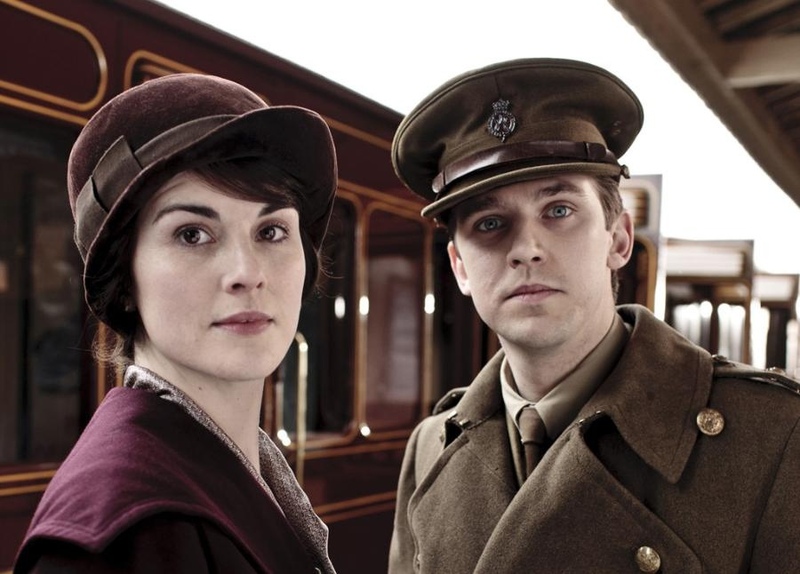 From National Public Radio’s story Saturday on Elizabeth McGovern to Sunday’s article in the Star Tribune about witty scripts, the return of Downton Abbey [to US shores] this weekend has the media in a lather. Rightly so, in my humble opinion. Hobnobbing with the rich and famous at Downton offers you something of a fill of British history and, given where the second season’s storyline is headed, world history too. It lets you ponder sociology and culture, women’s rights and politics. And, as I told a friend earlier today, it’s an excuse to sneak in some good old fashioned trashy romance stuff too. What’s not to like? Even without a TV, the Mandles are ready to leave our Minnesotan home in favor of a visit back to the estate as soon as Season 2 is put up on the PBS website. And the folks at Masterpiece Classic won’t mind that we stop on by. As the Strib article pointed out, viewership of Masterpiece is up 150% thanks to the history, or sociology, or politics at Downton. Or, just face it, the romance. Shows like Downton, “Upstairs, Downstairs,” and a reimagined Sherlock Holmes are evidence of a brand attracting a new audience by repositioning itself. The 43% ratings hike for Masterpiece indicates that this audience likes what they’re seeing. Now, please remember to leave your horse-and-carriage at home. Lady Mary is attracted to those who drive those new-fangled mechanized mobiles. The Economist magazine tweeted a story this week about the use of GoGo wifi in airplanes. The main point was that the quality of in-flight wifi service is so bad that only 4% of passengers have been taking GoGo up on the for-pay service. Although in-flight wireless is apparently better than the on-track service offered on select Amtrak trains, the connectivity is slow enough that the Economist writer suggested folks who find themselves airborne are probably more likely to opt to get done those tablet, laptop and mobile phone tasks for which Internet access isn’t actually needed. The commentary continued with a suggestion that the connection speed, coupled with airplane regulations that soon might permit use of mobile devices’ own services, would make offerings like GoGo’s obsolete. Current IPO notwithstanding. I have to rely on the writer’s points about service quality: The only time I really needed wifi service on a plane–to finish up a client report–the service ended up being broken for my leg of the journey. That said, the numbers in the hyperlinks of the article are pretty interesting. Specifically, the fact that only 4% of passengers are logging in. Not a high number at all, especially considering the quantity of fliers who are young children who maybe could do with a bit of distraction in the air, and business people who really needed to get that report done. For example. Another industry where wifi use figures are available–beyond transportation–is that of sports entertainment. Specifically, Minnesota’s own Target Field. While the Twins were bottoming out this past season, fans had the opportunity to avail themselves of the wifi access that was built in to the new ballpark. According to this article summarizing how the wifi system was integrated specifically for the park, about 1,000 people log on each game. Although that population size far surpasses the mere handful using airborne wifi while in-flight, it actually amounts to only 2.5% of the [in-stadium] audience. I would love to learn more about the online behaviors of people in-flight compared to those in-stadium. How long are they actually online as a percentage of total available usage time period? What types of sites or services are accessed? And, particularly in the case of the stadium goers, what might this mean for baseball fans’ attention to the game? I also think the musings in the Economist about the future of GoGo should take into account the use of wifi by folks in stadiums. Here on the ground people have 3G and 4G access. And yet, we still apparently have people who want to use the proffered wifi service. Might GoGo remain viable, then, even after those regulations change to permit mass use of fliers’ own phone plans? Columnist Charles Krauthammer wrote an interesting column in the National Review Online that ran in yesterday’s Star Tribune. With a title like “Are We Alone In The Universe,” it was an editorial people who know me well enough might have predicted I’d comment upon. Some of my past posts, like this one on Goldilocks Planets, should have been hint enough. The central premise of @Krauthammer’s piece is, much like Carl Sagan’s own comments from the Cosmos series in 1980, that humanity has yet to encounter other intelligent civilizations not because none have ever existed, but because the ones that have end up destroying themselves. I find @Klauthammer’s–and Sagan’s before him–premise plausible. But ever since I started Orson Scott Card’s Ender Series, there’s another potential explanation I’ve been mulling. If we find exoplanets potentially ripe for life that are orbiting stars hundreds or thousands of light years away, what we are seeing of those planets is actually traveling on waves of light (or particles of light, as some would argue) that left those planets hundreds or thousands of years ago. However many light years away the exoplanet, that’s how many years old the images are. Now imagine civilizations on those exoplanets–today–are looking at us with their own machinery. Like our technology, they are limited to imagery that travels no faster than the speed of light. So what they are “seeing,” is our planet anywhere from hundreds to thousands of years ago. Since we were building, at best, pitch pine ships or, at worst, pyramids within that frame of time here on Earth, we simply wouldn’t be emitting any signals viable for the exoplanetians to be picking up. As a result, those exoplanet civilizations might be just as likely as @Krauthammer to consider themselves to be flying solo. It’s a mind game that I find fascinating. Just as much as the thought of there being another planet–or more–out there harboring warm beaches on water-based oceans, vibrant flora, diverse fauna, etc. Here’s to learning more about other planets, our own and ourselves in 2012.